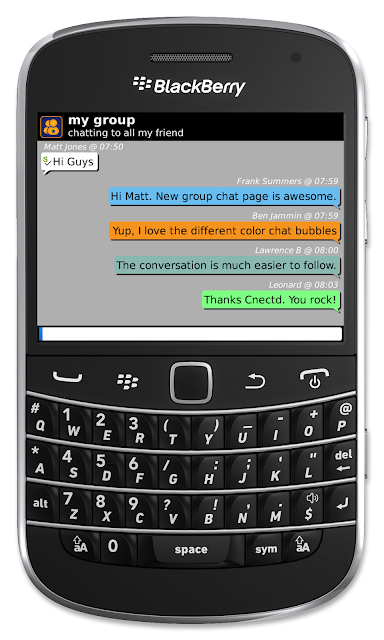 cnectd: Cnectd for BlackBerry V3.2.0 Update Now Available! Cnectd for BlackBerry V3.2.0 Update Now Available! The latest version of Cnectd for BlackBerry is now available. The latest version brings new features and enhanced UI elements. Download the latest version of Cnectd for BlackBerry now! Please visit http://dl.cnectd.com directly from your mobile phone or Download Cnectd from your App Store today! Love the new update! Those changes are just what we were looking for! Keep up the good work, we love Cnectd here in our work group and use it every day both at work and at home. Tried many cross-platform messengers before. WhatsApp, PingMe!, Touch, KiK, etc... But none of them made my day. Laggy, buggy power and memory consuming monsters. Maybe that's because they are all free. Decided to check this one out. Looks nice, so $2,50 for three year licenses are not expensive at all. Hope, Cnectd will prove I've made the right choice. Thanks very much for the kind comments. Guys! Any news on the long awaited update?.. The update will be coming very soon. Apologies for the delay!